Areas of Southern California saw rare summer thunderstorms this weekend, with rainfall that broke July records all over the state. 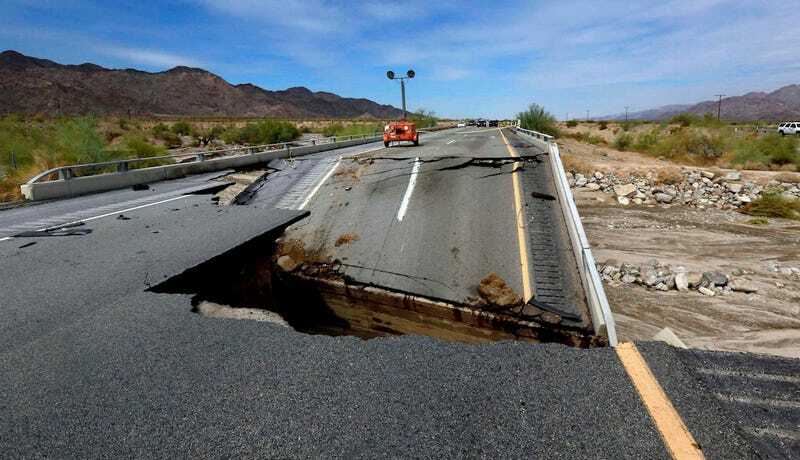 So much rainfall, in fact, that flash flooding dislodged a bridge and collapsed a section of the 10 Freeway—the major east-west freeway that links Los Angeles and Phoenix. One truck was trapped by the bridge that collapsed in Riverside County, just east of Palm Springs. The passenger escaped but rescue units had to pull the driver to safety. Other drivers used their tow ropes to secure the truck to the bridges guardrails so it wouldn’t be swept away. The Tex Wash bridge had been listed as “functionally obsolete” in a 2014 national inventory but was not scheduled to be fixed. But to answer your first question: Wait, Southern California? The very same Southern California experiencing a catastrophic drought? Some years it’s typical for Los Angeles not to see any rain from June to October but for the past three days we’ve seen rain—and a lot of it. The remnants of Tropical Storm Dolores turned the region into a muggy, moist mess and issued flash flood warnings from the Pacific Ocean to the Arizona border. These washes can sometimes see a significant amount of rain this time of year as part of the “monsoonal moisture” that brings afternoon thunderstorms to the desert. But the rains this weekend were unusually heavy. This scene might be a peek into California’s near future—predictions for a very strong El Niño could end up dumping more record rainfall onto the Western US. We need the rain, that’s for sure. But we also need to make sure we’re ready for a lot more of it by checking our infrastructure and collecting as much water we can before it’s flushed out to sea. The freeway remains closed today meaning that all traffic which normally travels between LA to Phoenix will need to detour hundreds of miles out of the way. The 15 Freeway, which heads northeast out of the state, was also closed for a short time this weekend after a wildfire jumped the freeway and charred dozens of vehicles.